Our four-legged friends will convert almost any piece of soil into a huge crater with great enthusiasm. One should try to redirect this behaviour. Learn why dogs generally love to dig and why some dogs do so more than others. We will of course give you tips on what the possible causes of this behaviour might be and how to stop them from happening. The fact that many dogs, with great pleasure and growing passion, enjoy digging and transforming your freshly laid out garden into a crater-like landscape, should not be underestimated as a problem by dog owners. Many dogs love to dig and unfortunately don’t care about our valuable climbing roses or the organic cabbage we grew from a seed. Basically, digging is a natural, non-breed specific trait; it can however be better or worse in some dogs. Hunting breeds are especially passionate diggers as they are bred to penetrate underground structures in order to catch or chase vermin. 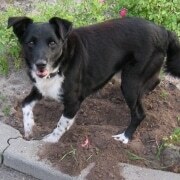 Other dogs, for example, dig a hole for their bed so they can be cool when the temperature rises. It seems that especially those plants that we plant so lovingly are happily “replanted” by our four-legged friends. This certainly has to do on the one hand with the joy of social contact the dog has with us and a “common hole”, or perhaps he has found some hidden food. To better analyse the odour of the soil, the dog scratches with his paw on the ground. Sometimes the smell attracts a mole or a mouse and when the dog digs and successfully catches one of these animals, the hunting instinct is awakened. Often, the boredom and too much energy is the trigger for canine gardening. Dogs are curious and active, so they want to be busy. So when dogs turn the garden into a lunar landscape, one should consider first how one can give the dog more. Dogs are bundles of energy when they have no walks. They also need mental tasks and attention. How can you redirect this behaviour? It is important that the dog is distracted with other things like searching for toys or treats, ball games or other exercises. Keep in mind that it makes little or no sense to the dog to send him out into the garden and hope that he is not going to dig. He will also not understand that he may not dig in your absence either. The best thing to do is catch him in the act and make it clear that this behaviour is undesirable. Create alternatives by setting up a corner where your dog may dig. It could be in a sand box or a hidden corner in the garden. If he does not like this, please be patient. You dig there, bury some treats or toys that he can find and dig out. Do not let your dog into the garden alone during the learning phase so that he can head straight for your flowerbeds. Remember to reward him if he does something right! If all efforts are unsuccessful, then seek help from an expert or a dog school. Tags: Why do dogs dig? https://meradog.co.za/wp-content/uploads/2016/05/meradog-dog-dig.jpg 812 1829 Janine Meyer https://meradog.co.za/wp-content/uploads/2018/05/MERA17_Logo_Dach_04.png Janine Meyer2016-05-11 19:56:172016-05-11 19:56:17Why do dogs dig?